Louix will be traveling abroad over the next couple of months, first to Egypt on a sacred pilgrimage to Mt. Sinai, and then to Australia to visit His Melbourne ashram, Sundara Aravinda. There will be a series of events taking place during Guruji's visit to Australia, including a public darshan at the beautiful BMW Edge, in the heart of downtown Melbourne. 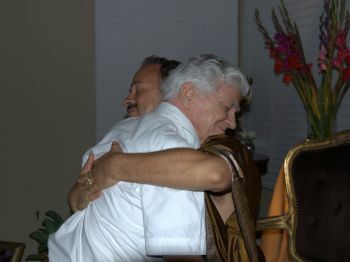 While Louix is traveling, there will be many opportunities to receive His love at the various programs here at Prema Drala Ashram in Southern California. Please check our Upcoming Events for our regular study groups and our Become More Involved section for specific volunteer opportunities, including our new Seva Saturdays! We are very excited to announce that we are producing a special live Internet-based event with Louix! This event will be held on 13 September 2012 and will consist of a discourse and possible Q&A on a very timely topic. This free event will be available to all, with a limited-time replay for those who cannot attend. Our aim is to reach as many people as possible, to gift them with a full experience of Louix's love, wisdom, and Darshan! In preparation, we have been busily rebuilding the existing Louix.org website. We will also be upgrading the current live videoconferences into a membership site called Louix.tv. This new site will provide subscribers with 24/7 access to exclusive monthly content, along with our regular twice-monthly videoconferences. There will also be a community forum where people will be able to interact with other members, along with a variety of other exciting features. To help us accomplish this goal, we are asking for your help. The budget for this event is $20,000, which consists of online marketing costs, website development, and necessary video equipment upgrades. This is on top of the hundreds of hours of volunteer time necessary to make this possible. If you feel in your heart to contribute, and would like to help Louix reach the world via this special event, we are asking for donations. All donations are tax deductable. For details on how to make a donation, please click here. When making a donation, please specify that it is for the “Live Internet Event” so we can make sure your funds are allocated for this project. We thank you for your on-going love and support. We are excited to announce that the New Year’s Eve Retreat will once again be held at Enchantment Resort in Sedona, Arizona from December 29th, 2012 to January 3rd, 2013. It was such an amazing experience to be with our beloved Louix amidst the resort’s breathtaking nature setting last year—and due to overwhelming positive response—that we were only too happy to book Enchantment Resort again... and we are now ready for people to sign up. Just a reminder: this is the busiest time of year for Enchantment Resort, so space is limited. We are encouraging those who are going to join us to please register much earlier this year. Please click here for more information, or to register. We look forward to seeing you all there. 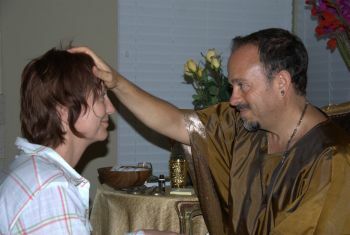 On May 12th, many people received the blessing of darshan from Louix at Prema Drala Ashram. Pranam played a beautiful set of music to accompany the event. One attendee was almost unrecognizable from the first time he received darshan from Guruji only two weeks prior. He was glowing and looked completely transformed. It was a miraculous evening. On May 26th, Louix and Pranam led an Ecstatic Singing at Prema Drala Ashram, with thirty-two people joining them. The evening began with Peter DeWitt welcoming everyone and leading an opening prayer. Some of the song highlights included “By Thy Grace,” “Om Namah Shivaya,” and “Madre Divina.” Many people gathered around Louix, in a circle on the floor, joining hands and singing fervently. Crying and laughter spread around the room as Louix gazed into the eyes of each person. * All events are by donation, except where noted. July 25th (Wednesday), 7:30 p.m.
Open to all faiths and all cultures, these Study Groups offer a regular forum to explore Louix's teachings and learn the many practical tools He offers to accelerate one's spiritual development and live in greater joy and inner peace. August 25th (Saturday), 7:30 p.m.
Come for a personal blessing from Louix, and be enchanted by the world devotional music of Pranam, who will be performing live. August 29th (Wednesday), 7:30 p.m.
A regular forum designed to explore and learn Louix's teachings. Join us for a special live Internet-based event with Louix, which will consist of a discourse and possible Q&A on a very timely topic. September 15th (Saturday), 7:30 p.m.
Come receive a personal blessing from Louix. September 29th (Saturday), 10:00 a.m. – 6:00 p.m.
Immerse yourself in this spiritual Master’s wisdom, grace, love, and humor as you receive His personal guidance to move you into deeper levels of self-mastery. 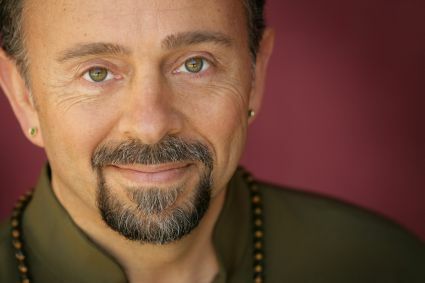 During these six love-filled days at world-renowned Enchantment Resort, you will receive illuminating discourses on many topics, immerse yourself in the joy of ecstatic singing, have the rare opportunity for direct personal guidance from this spiritual Master, as well as enjoy nature hikes and gourmet vegan cuisine. Families are welcome, and a children's program is provided. Louix Dor Dempriey offers His darshan and Divine guidance through a series of videoconferences that are held on the first and third Thursday of every month. These live conferences with Louix include discourses, as well as the opportunity to submit questions to Louix and receive His guidance on topics of personal and general concern. 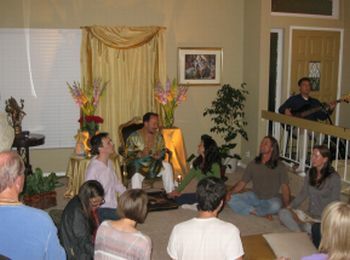 He also shares many tools for spiritual growth, such as chanting, body and mind purification techniques, and guided meditations. These conferences are recorded and the video is made available to registrants for future viewing from our Video Library, and the audio is available for download in MP3 format. Join Louix on live videoconferences, which are available to everyone worldwide. Special Note To Current Subscribers: While Louix is traveling over the next two months, our bi-monthly videoconferences will be airing special premiere screenings of Louix speaking at a retreat and a television interview! SPECIAL OFFER: For every 2 conferences purchased, you have the option to purchase one archived recording for half price ($10.00). Dates and Time: The last Wednesday of every month (except in December) at 7:30 p.m. The Louix Dor Dempriey Foundation is primarily run by volunteers, and we are always in need of assistance in a variety of areas. We currently have positions for gardening, house cleaning, audio and video archiving, video editing and videography (at events), and general administrative help. Please call or e-mail to schedule a time that suits you. New Seva Saturdays: In an effort to encourage volunteers we have an open day every Saturday for anyone to come and serve at Prema Drala Ashram, in any of the areas mentioned above. Seva hours are between 10:00 a.m. - 3:00 p.m. If you are interested in volunteering or wish learn more about the various seva projects we have, please contact Sylvia Zsido at (949) 292-2699 or sylvia@Louix.org (U.S. and other regions), or Kharananda Mayi at +61 3 9885-2993 or kharananda@Louix.org (Australian inquiries). We are so grateful to all those who have donated to the Louix Dor Dempriey Foundation. This Foundation is funded primarily by tithing, donations, and philanthropic offerings to help us fulfill our goal in service to humanity. To make a donation to the Foundation, please click here. Your donations are tax-deductible to the extent allowable by law. Thank you for your loving support of the Louix Dor Dempriey Foundation! If you would like to host Louix or help coordinate an event in your area, please contact Mirianna Schroeder, Events Coordinator. Please feel free to pass this e-mail on to anyone you know who would be interested in these special events and updates from our Foundation. You can also visit www.Louix.org for more information. About Louix Dor Dempriey: Louix Dor Dempriey is a spiritual Master who has come into this world to help others restore their inherent divinity and live as unconditional love. Louix's darshan, as well as His illuminating discourses, meditations, and ceremonies, have invoked profound transformation in thousands of people worldwide. With grace and humor, Louix imparts timeless wisdom in contemporary, practical teachings—that transcend all faiths, paths, religions, and cultures—making self-mastery and true inner peace attainable for all. He resides at Prema Drala Ashram in Laguna Hills, California. For more information, please visit: www.Louix.org. About Pranam: Pranam is an ensemble from Prema Drala Ashram who blend music styles from various sacred traditions to create an uplifting musical experience for people from all walks of life. Pranam is sponsored by the Louix Dor Dempriey Foundation. For more information, please visit: www.Louix.org.